Many of us I’m sure, are familiar with the story of Ruth in the Bible. This story I believe as many others do, is a message to the Church today. There is an application in the story that God wants us to hear and understand. Before I come to the application, I will summarize the story. There was a man named Elimelech who had a wife named Naomi and two sons. They left the promised land because a famine had come upon it. They did not seek the Lord, as many did in the times of the Judges, but they went out of the land and settled in Moab. As time passed by, Elimilech died and Naomi was left with her two sons Mahlon and Chilion. These two sons married Moabite women, named Orpah and Ruth. After some time both of their husbands died. Naomi was heartbroken about the loss of her sons. She lost her faith and joy and decided to return to the promised land. So the three went out towards Israel, the promised land. But when they came to a bend in the road, Naomi told her two daughters in law to stay in the land of Moab and their gods. She said, I have no more sons to give you, return to your homes. Orpah turned around and went back to her land and her gods, but Ruth clung to Naomi. She was not going home and she was determined to go with her Mother in law into the land of Israel, to the hometown of Naomi which was Bethlehem, Ephrathah in Judea. So she petitioned Naomi and said some of the most beautiful words written in the Bible. “Entreat me not to leave you, or to turn back from following after you; For wherever you go, I will go; And wherever you lodge, I will lodge; your people shall be my people, and your God, my God. Where you die, I will die, And there will I be buried. The LORD do so to me, and more also, If anything but death parts you and me.” When she saw that she was determined to go with her, she stopped speaking to her.” Ruth 1:16-18. Ruth had fallen in love with Naomi and the God of Israel, the God of Abraham, Issac and Jacob. Both of them set their eyes towards the promised land and went on their way to Bethlehem. One day Ruth was gleaning the fields and she met Boaz who was very kind to her because he had already learned about her and how she was a good daughter in law to Naomi who was a relative of Boaz. As Ruth was coming home, Naomi was amazed at how much Ruth had gleaned. She asked her which field she was gleaning in and she told her that it was the field of Boaz.Naomi was beside herself and thanked the God of Israel who had shown favor on her. Long story, short, Naomi became the match maker and Boaz married Ruth. They had a child together who’s name was Obed, who was the father of Jesse, who was the father of the future King of Israel, David. What can we as the church learn from this story? How is it relevant for us as believers who believe in the God of Abraham, Issac and Jacob? What is the application for us today? Just as Orpah turned her back on Israel, so today many of the churches have turned their backs on Israel. They teach a replacement theology and that all the blessings and promises that God gave to Israel are now belonging to the church. At a time that Israel needs us most, many have turned their backs. But there are some within the body of Christ that want to bless and support Israel. The Land of Israel is God’s land. It belongs to Him and no one else. It is the Land where He gave His only begotten Son and it is the Land where Jesus will return to rule as King from Jerusalem. It is the Land where God will reveal His Son to the Jewish people. Just as Ruth loved the Jewish people, so we as the church need to love and support them. We need to pray for them and help them to return to the land given to them so long ago by God through a promise to Abraham. God is fulfilling the Abrahamic covenant today and all the unconditional blessings that come with this covenant. He wants to bring back His people to the covenant of faith, not of the law. The law was given to Israel 430 years after Abraham because they had left the faith and went after other gods and everybody did what was right in their own eyes. The law was a Tudor, showing people that they can never live up to the righteousness and Holiness of God. Now that God has brought them back into the land, in unbelief as prophesied in Ezekiel 36 and 37, He will one day open their eyes and they will see Yashua. The will believe, just as Abraham believed and it was accounted to him as righteousness. We as true biblical believers are not sons of Moses and the law, we are the sons and daughters of Abraham by the grace of God through faith. We need to bless Israel and the people of Israel and worship the LORD in spirit and truth. Israel is not out of the picture and God has not cast them aside. Israel is the apple of His eye. We as the church have a role to play in these last days. If we want to be blessed by God, we need to stand with His chosen people. 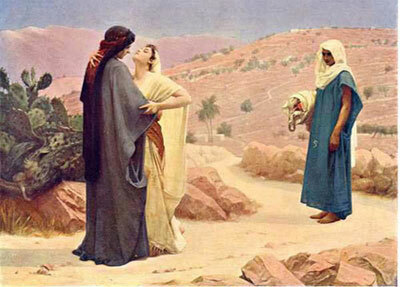 Ruth chose to go with Naomi to the land and she loved the God of Israel and He blessed her there. This is what God wanted all along, the Jew and the Gentiles coming together as one, which was and is part of the unconditional covenant with Abraham in Genesis chapter 15. “I will bless those who bless you, And I will curse him who curses you; And in you all the families of the earth shall be blessed.”Genesis 12:3. “…just as Abraham believed God, and it was accounted to him for righteousness. Therefore know that only those who are of faith are sons of Abraham. And the Scripture, foreseeing that God would justify the Gentiles by faith, preached the gospel to Abraham beforehand, saying, “In you all the nations shall be blessed.” So then those who are of faith are blessed with believing Abraham.” Galatians 3:6-9. Hey Freddy..hope you’ve been okay. Haven’t heard from you in a long time! Let me know you’re alright..God bless you! Thank you Lyn, I’m honored and humbled by your kind words. I am blessed to have you as a friend. “By this all will know that you are My disciples, if you have love for one another.” John 13:35. Thank you Kristi, many blessings to you. It’s just another confirmation that the Lord is sending me back to Israel. That He is sending me to Bethlehem. Thanks for hearing and being obedient in sharing His word in a timely manner! Another wonderful and thought provoking post; thanks Freddy. If everyone knew what a busy man you were in your life, they would then know how loyal and devoted you are to God to take the time that you do to put into these posts of yours. You’re such a wonderful, blessed man and disciple of Christ. God bless you. It is you who has helped me when I first made my own blog, and through the Lord, inspired me so. In Christ, I love you dearly!